Dental treatment has evolved so much over the past 30 years that today’s dental appointment bears little resemblance to dentistry of the 80’s and 90’s. From same day crowns to digital xrays and more comfortable anesthetic techniques, having your teeth restored has become a much more pleasant experience. 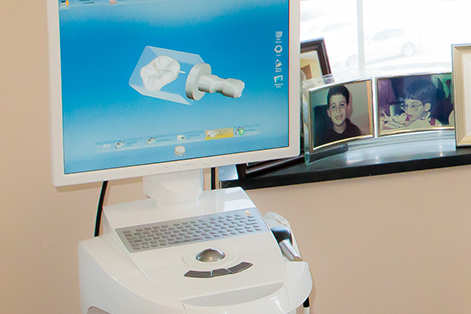 Here are a few of the latest pieces of technology that we employ in the office to make your dental experience as comfortable, efficient and successful as possible. If you have had a crown made for your tooth in the past, you probably remember the process: first appointment- Novacaine, prepare the tooth, goopy impression of the tooth for several minutes, a temporary crown is made and cemented; second appointment- more Novacaine, remove the temporary and cement in the permanent crown. Now with the advent of CAD/ CAM milling technology, we are able to offer same day crowns. In just one appointment, we prepare the tooth, take a digital scan and then while you read a magazine, your crown/ onlay is milled and ready to cement in. The entire procedure takes 90 minutes- no more bulky impression trays filled with goop that can gag you, no more temporary crown that comes off too soon and no more coming back for a second appointment. And the best part is that with digital technology, you can be assured that this will be the most accurate, best fitting crown/ onlay possible! When it comes to getting a “Novacaine” shot, patients hate two things: getting the shot and the numb feeling long after the procedure is done. We now have the technology available to only numb select teeth while keeping the rest of your mouth unaffected during a dental procedure. And the injection for that single tooth is virtually painless. By concentrating or localizing the numbed area more precisely, we enable you to leave the office without the typical “drooping face” of traditional numbing. The STA process results in far less residual discomfort after the procedure, too, and most patients are able to eat again right after their appointment! Using less than half the amount of radiation of traditional film radiographs, our x-rays are captured digitally and they immediately appear on the computer screen for review. Digital x-rays provide an instantaneous image that can be manipulated for maximum sharpness and accuracy, giving a high-def overview of your teeth. Although digital radiography is an example of emerging technology in dental offices today, we have provided this service to our patients for over 15 years! Surgical microscopes have been utilized in medical surgery and ophthalmology for many years. But we have used a surgical microscope for over 15 years in order to create the finest, most well-fitting crowns and veneers for our patients. Traditionally, in dentistry, microscopes have been used in dental specialists’ offices (such as root canal and gum specialists) but in an effort to provide the highest level cosmetic and restorative dentistry , a surgical microscope becomes simply indispensable! Our Panorex digital camera rotates 360 degrees around your head and instantly produces a high-definition view of every tooth in your mouth – including wisdom teeth. This clear picture allows us to quickly rule out infections, TMJ issues and other pathology – as well as determine the exact location of wisdom teeth – so early and effective treatment plans may be formulated before you experience any pain or discomfort. Traditional dental drills are air driven which gives them the distinctive high pitched whine and excessive vibration. Electric handpieces are much quieter (not silent, unfortunately, but a definite reduction in pitch and volume) as well as smoother which translates to much less vibration and a thoroughly more comfortable experience. And lastly, the measured output of an electric handpiece makes for a more precise, smoother restoration- making for better fitting veneers and more highly polished bonding. 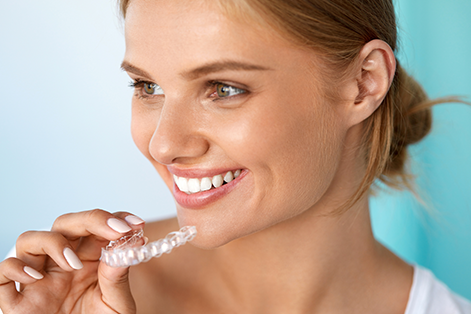 If crooked teeth, gaps in your smile, crowding, an overbite or other minor balance issues are making you uncomfortable, we have a unique and perfectly wearable alternative to traditional braces – Invisalign® clear dental aligners. Invisalign aligners are a great choice for professionals because they are not only virtually invisible, they require practically no lifestyle change. Invisalign’s aligners are made of clear, medical-grade plastic so no one can see that they are there. These subtle braces are also smooth and comfortable and will not cause the cuts, chafing and abrading that metal braces sometimes cause. And to top it off, you can even remove our aligners! That means you can continue your oral care regime as usual with no changes in your brushing and flossing habits. It also allows you to take your aligners out for a special occasion, public speaking, to sing or play an instrument. Professional musicians love Invisalign for just that reason! This is dentistry that fits your lifestyle. Dr. Minch is one of a kind. His dedication and relentless pursuit of higher education is inspiring and contagious. What I respect most about him, is his passion to lead everyone he cares about to learn with him. He is a great mentor and has changed my life in many positive ways. Over the years, he has organized multiple meetings with top level experts in our field. He volunteers countless hours to teach other dentists. His patients appreciate the level of care they receive from such a devoted caring dentist. I feel honored that Dr. Minch invites me to learn with him.